Bath and Body Works 'Pink Lemonade Pound Cake' Mason Jar Candle, purchased from eBay-Pink lemonade is one of my all-time favourite drinks so it seems almost inevitable really that I'd like this candle. It smells amazing! The scent is like a mix of lemon sponge cake with a hint of sweetness, perhaps even grapefruit-esque notes too. The scents linger for hours after as well. I've still been able to get a whiff of this after replacing the lid on this candle. Elephant and Bird 'Dream Believer' Pillowcase, not pictured-Does anyone know how hard pillowcases that aren't attached to pillows are to photograph? Anyway, I just lurve this and I loved this stall at the fair. Luckily you can buy from them online so if anything takes your fancy you can go ahead and shop. Frankie Magazine, Issue 60-Frankie is like an old and loyal friend for me. It never disappoints me and I can spend hours getting lost in its pages. In fact, it's one of my favourite things to pack in my bag on long train trips. This issue has been one of my favourites recently. The floral and art prints inside are both beauts. If you're in Australia or New Zealand, get your hands on this one. YSL Baby Doll 'Kiss and Blush' in #01-I picked this little number up in a blog sale recently and I love it. The colour reminds me a bit of the new Bourjois Velvet Lipstick in Pink Pong. A vibrant fuschia, this liquid lipstick is so easy to apply which has to be down to the spoon-shaped applicator. The colour itself dries down to a satin finish and is so long wearing. It's not drying in the slightest and while the colour does wear off eventually, touch ups aren't essential as you're left with a gorgeous stain on the lips. Broken Bits Clay Hearts, purchased from the Auckland Art and Craft Fair-There doesn't seem to be an online store for this seller, but she does have a Facebook page and travels around various Auckland markets. You may have seen these cropping up in various blog pictures and that's because I think they're so pretty. I can't wait to hang them up on my wall eventually. 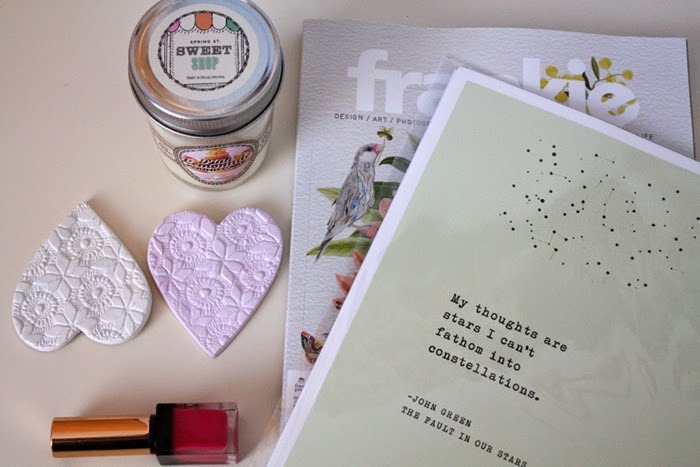 The Fault In Our Stars Print-Love. This is my favourite quote from the entire book although there are so many to love within its pages. I'm not gonna lie, the mint green background and old school typeface were both big drawcards too. -Have you had any particularly spendy moments recently? What did you splurge on? ADORE that John Green quote!